In order to facilitate this process of deciphering these texts (and help you review), I’ve color coded my transliteration --> blue indicates roots that appear in the verb glossary  and are either in a verbal [10, 14 – 16], nominal  or adjectival  form; orange indicates prepositions  and yellow indicates important prefixes and suffixes: the construct state , the accusative marker , possession  and the medio-passive ta-prefix . What’s left are, for the most part, easily recognizable cognates and proper nouns. I’ve glossed a few important terms below each text. Good luck! Just wanted to let you know about the new experimental Semitic Transliterator at SemiticRoots. I ran some of your Ge'ez text through it from this article and it came out quite close to your transliterations. The mapping is based on the values in the Wikipedia article about Ge'ez Script. This is a great resource Abu Rashid, I intend to use it - thanks! Hello I wonder if you could help me. A library has provided some scanned pages of a text that they think is Ge'ez, but they aren't sure and they have asked us to identify the language. If you could contact me mark (@) a2ztranslate.com I could send you some samples? Hamza, I run a website called Lexicity, which features resources for ancient languages. We are interested in featuring some of your resources on our site. Is there an email address or other form of communication at which we can contact you directly? Hello! Yes of course, my email address is: hm298@cornell.edu. Looking forwarding to hearing from you. My name is Belay and I hail from Ethiopia, currently living in USA. 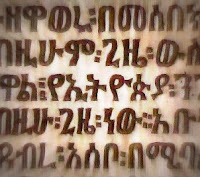 I am eager to learn Ge'ez but I can tell whether something is Ge'ez or not because my Amharic is a child of Ge'ez. You may either post a sample as an image or email me to belaytekalign at hotmail.com. Change the “ at” to @. Trying to avoid internet bots. I Forgot to mention that I am not a linguist, but since learning Ge'ez is a visa to see my grand-grand-grandfathers and understand their thoughts (so to speak), I have tightened my girdle to walk the path. Hope to find some amateurs like me in my travel. I checked out your blog -- it looks wonderful! I'm glad this blog can be of some assistance to you as you start working on your Ge'ez. It's an incredibly beautiful language with a rich literary corpus, as I'm sure you know. Good luck on your travels! 21: Verbs: The Passive Voice etc.